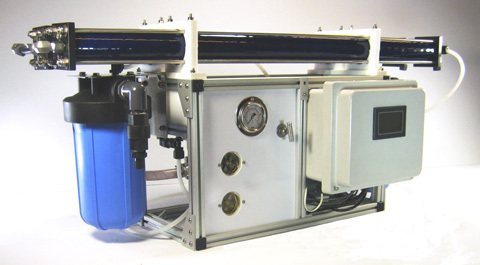 We started building watermakers - Reverse Osmosis Desalinators in 1996 and many of our first systems are still providing gallons of fresh water every day for voyagers around the globe. Our new BALCEN Series product uses a rugged and reliable PLC (Programmable Logic Controller) with industrial-grade pressure and flow sensors that insure safe operation by protecting system pumps and membranes. The control system features an automatic fresh-water flush cycle to provide optimum service life and trouble-free operation. The components used in our systems are chosen from high-quality manufacturers whose products provide years of reliable service in the demanding marine environment. Manufacturers include CAT PUMPS® , Parker Hannifin, Dow Filmtec, Panasonic, PENTEK and IWAKI Pumps. Industry Standard fittings and components are used wherever possible: filter housings, pre-filters,membrane elements, pressure vessels, and connectors are all industry standard – not proprietary one-source products – ensuring your ability to find the part you need easily no matter where your voyages take you.